Connects directly to iPhones (6, 6plus, 5S, 5, 4S, 5C) and most iPads. iPhone 4S, iPhone 5, 5S, 5C, 6, 6plus, iPads Air & mini, iPod touch 5th gen, iPod nano 7th Gen and newer versions of these iOS devices as they are introduced. Samsung Galaxy S5, S4 & S3 using Runtastic, Runtastic Pro, SportsTracker & SportsTracker Pro. It connects directly with your iOS device using Bluetooth Low Energy. No dongle is required. 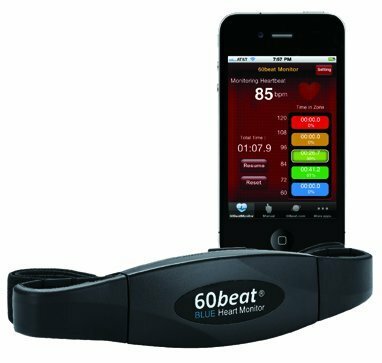 It works with any App that is compatible with a Bluetooth Low Energy heart rate monitor. This includes 60beat App, Runkeeper , Runmeter , MapMyRun , Endomondo , Cyclemeter , Runtastic , LogYourRun , Pedometer Pro , iBody, Strava Run , Strava Cycling , Buddha Mind , 321run , Spinning and many more. Most apps are free or low cost. The Nike App on the iPod touch gen 7 is also compatible. The Apps cover running, cycling, walking, indoor fitness, wellness, weight loss, meditation, sleep therapy, heart rate variability and more.